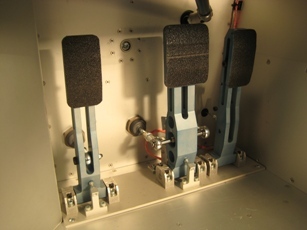 Example: pedal group for sports car, assembled on an adjustable base plate. Pedals made of anodised aluminium, shafts made of stainless steel, rod ends SKF, bearing bushes INA. Brake pedal with integrated adjustable balance bearing, for adjustment of brake balance. Throttle pedal with mechanical push-to-pull converter, or potentiometer bracket (option).